Hopson on USM coaching job: "I'm home"
HATTIESBURG, MS (WDAM) - A press conference was held at USM Monday afternoon introducing the new head football coach Jay Hopson. Bill McGillis opened the press conference with a brief description of the USM football program's history, and Hopson's coaching career. Hopson was the former head football coach at Alcorn State University and has worked as an assistant coach at Tulane, Delta State, LSU, Florida, Marshall, Southern Miss, Ole Miss, Michigan, and Memphis. 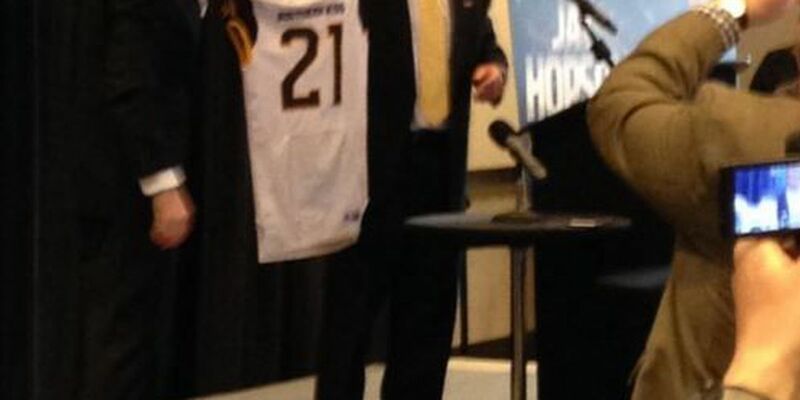 Hopson is the 21st head coach for the University of Southern Mississippi. "This really is the opportunity of a life time," said Hopson when he took the podium. "This is my dream job, I'm home." Hopson credited former USM head coach Jeff Bower as his biggest influence in his career, and also gave his respect to what former head coach Todd Monken did for the program. "I think what they did was tremendous, going from 0-10," Hopson said. " "Southern Miss was a consistent winner, that's my vision for the program." Hopson also stressed his priority of recruitment, and how important it was to recruit from high school football programs in Mississippi. "I'm really passionate about Mississippi high school football programs," said Hopson "I think we have some of the best football players in the country, and we need to use our local athletes." Hopson ended his speech with a promise to the university. "My promise to you is to make sure we're consistent winners year in and year out," Hopson said. Media addressed Hopson at the end of the conference, where he spoke of staffing, his ability to takeover a football team quickly, and how the last 48 hours have been for him. "It has been pretty crazy, hectic," said Hopson. "It was one of the toughest days to say goodbye to a team you love, but its a challenge and opportunity I am looking forward to." Hopson said he will address staffing on Thursday, and "wasn't looking to fire anybody."